Theme pack support lets customize icons, fonts, system sounds and pixel density in Sailfish OS. Remember to unapply themes before system updates. It contains no themes, it's just the engine which makes applying themes possible, but you have to install them separately. For Sailfish OS 2.1 users: if you've used the font size changer, reset it via the theme pack support before changing it via the Jolla Settings. Install a compatible theme pack. Open the app via the icon on the homescreen and insert your root password. 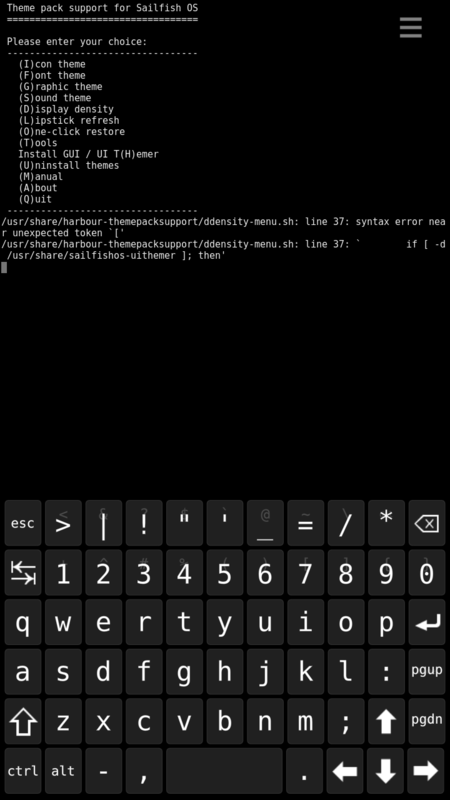 You can also start it via terminal by typing themepacksupport as root. Apply the theme pack of your choice. - Fix for Android icons on the XA2 (thanks to Eugenio_g7). - Overlay support improved for Sailfish X. - Improved non latin font support. On sailfish os 3.0.0.5 : we can't change pixel ratio. It reset to default when restarting home screen. Did you try to uninstall and reinstall it? 1- Give you an access: Go to developper toosl in Settings and setup an SSH access. 3- Once loged in as root, do "pkcon refresh". Edit: After rebooting my phone I've got an error :D It's probably an openrepo/sailfish issue. It's a file not found on "./non-oss/noarch/sailfish-content-graphics-closed-z2.0-0.6.1-10.2.1.jolla.noarch.rpm" not found on medium "https://release.jolla.com/releases/2.2.1.18/jolla/armv7hl/". I can't install it anymore. I re-intialized my sailfish X in setting. Then updated to the latest OS version... And then I am here. From "storeman", after adding the repo, when you trie to install it it start loading then said "not installed" without more informations. When trying manually from the package from the openrepo website; we got "an error occurred" and again, no more information. It's sad I can't give you any meaningfull information for now expect saying that it indeed isn't working on sailfish X. I will try from a terminal soon when I got the time. Unluckily I can't test it now as I don't have a Sailfish X yet. I'll update the engine to support it asap. After update now changing pixel ratio works on Xperia X. Thanks a lot! I have upgraded to 2.1.3 and uithemer seems non compatible, while theme pack support works, atleast for fonts. I am not sure if I have a display density issue or I am not inputting the correct values in the theme pack support, when I input 0.90 as value is that the correct way to do it? UI themer isn't able to apply any fonts as it can't refresh the homescreen after selection of the font, and the pixel density slider remains on default value. sailfish-content-graphics-default-z1.0-base can't be found, and installing sailfish-content-graphics-default says "This request will break your system!". Which phone do you have? Have you tried a preliminary pkcon refresh ? I could sweat, I've tried that before.. but now it works! Thanx! Im stuck with this app. I am not open the theme app. And also I am unable to delete the theme app. Kindly help me. Why can't you delete it? Is there any error message? I just updated the app but face the same issue, I cannot use theme fonts anymore. After applying it shows on the app as being the font in use, but refreshing lipstick and rebooting Jolla has no effect, the default font remains. Any fix to this would be greatly appreciated. After, you may be able to apply fonts again. Since the last system update, I'm not able to install fonts anymore. Any idea? Have you restored the default font before upgrading?